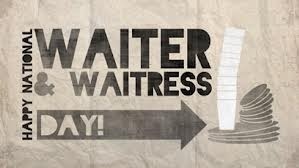 With just under 600,000 restaurants in this country, it can be quite difficult to stand out as a waiter or waitress. For those of you who go above and beyond to provide exceptional service to your patrons, this day serves to honor your hard work and dedication to your craft. For those of us who are not part of the wait staff, it is important to realize that across the country, about 70% of states pay less than $5.00 per hour to tipped employees. So, with that in mind, it is time to stop thinking of a tip as an “extra bonus for great service,” and start thinking of it as part of that person’s salary. So go ahead and give your server an extra few dollars today to thank them for their hard work, they’ve earned it! If you’re feeling extra generous, why not purchase your favorite server a new restaurant uniform from ChefUniforms.com?